GreenWave Reality Named the "Nobel Sustainability® Supported Clean Tech Company 2013"
MILPITAS, CA--(Marketwired - Nov 5, 2013) - The Z-Wave Alliance, an open consortium of leading global companies that oversees Z-Wave, the world's largest ecosystem for wireless home control products and services, is proud to congratulate Alliance member GreenWave Reality for winning the Nobel Sustainability Clean Tech Company 2013 Award. The prestigious honor was announced by The Nobel Sustainability Trust®, a Nobel family initiative. The recognition "Nobel Sustainability® Supported Clean Tech Company" is awarded to companies holding outstanding and scalable technologies enabling an acceleration of the sustainability transition and access to energy for all. Through this recognition, the Nobel Sustainability Trust® seeks to successfully push forward the implementation and awareness of these technologies. 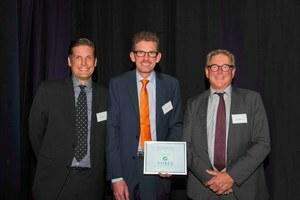 Z-Wave Alliance member GreenWave Reality is the third company, and first Danish company, to receive this recognition. The company's Home2Cloud solution engages consumers in their energy consumption by making it visible and manageable. Users can now see and understand their energy consumption at home, and utility companies gain improved control of production optimization as they can monitor consumption in real time and more accurately predict peaks and lows in consumption. "Our heartiest congratulations go out to GreenWave Reality for this remarkable achievement," said Z-Wave Alliance Chairman Mark Walters. "Energy management capabilities have been a hallmark of Z-Wave since its introduction more than ten years ago. Smart household electronics that can speak to each other, and to energy consumers and suppliers themselves, are the essence of the clean tech revolution. We're proud of Z-Wave's role in this revolution, and especially proud of GreenWave Reality's having garnered this most prestigious award." "It is a great honor to receive this recognition," said Martin Manniche, Chairman of the Board and CTO of GreenWave Reality. "It provides great satisfaction and encouragement to continue developing solutions that give consumers an incentive to save energy and provide utilities a new form of engaging content. Our award-winning Home2Cloud platform, now further recognized by the Copenhagen Cleantech Cluster and Nobel Sustainability Trust®, creates a tangible view and management of energy-usage, which tests has shown immediately bring down consumers energy usage." Z-Wave powers the world's largest ecosystem of interoperable smart home products many of them designed to promote more efficient use of our natural resources saving users money and saving wear and tear on the planet. Z-Wave Alliance member companies strongly believe in and support a sustainable future and technologies role in reducing our impact on the planet. To see other products that work towards a sustainable future please visit www.z-wavealliance.org . Formed in January 2005, the Z-Wave Alliance is a consortium of leading companies in the home technology space dedicated to solidifying Z-Wave as the standard for wireless home control products. The principal members include; Evolve Guest Controls, FAKRO, Ingersoll-Rand, Jasco Products, Linear and Sigma Designs. Alliance members lead the home controls market, providing leading edge products and systems that deliver increased comfort, convenience, energy conservation, safety and security. For more information about the Z-Wave Alliance, visit www.z-wavealliance.org. Gustaf Nobel, great grandson of Ludvig Nobel, brother of Alfred Nobel, has together with 3 other Nobel descendants founded the Nobel Sustainability Trust® in order to continue the Nobel legacy, and to pursue the sustainability combat started by the Nobel family more than a hundred years ago. The Sustainability Award, the Sustainable Energy Conference and the Sustainability Funds constitute the main pillars of the Nobel Sustainability Trust®. For more information, please visit www.nobelsustainability.org. Founded in 2008, GreenWave Reality empowers consumers to achieve the smart connected lifestyle by delivering personalized information and entertainment, enhanced comfort and savings. GreenWave's Home2Cloud platform is highly secure and scalable allowing its service provider partners to confidently leverage the broad capabilities of Internet of Things and Machine-to-Machine communications to create their own value-added managed services. In addition, GreenWave offers its own award-winning services including Connected Lighting, Home Monitoring and Energy Management. The company has customers that include leading service providers, lighting manufacturers, and utilities. GreenWave Reality is privately held and headquartered in Irvine, California with offices in Copenhagen and Singapore. For more information, please visit www.greenwavereality.com. Z-Wave technology and is an open internationally recognized ITU standard (G.9959). It is the leading wireless home control technology in the market today, with over 900 certified interoperable products worldwide. Represented by the Z-Wave Alliance, and supported by more than 250 companies around the world, the standard is a key enabler of smart living solutions for home safety and security, energy, hospitality, office and light commercial applications.